Principal Race Courses in the U.K.
Goodwood racecourse lies high up on the South Downs on the Goodwood estate, owned since 1694 by the Duke of Richmond. Racing began there almost by accident when, in 1800, the 3rd Duke of Richmond put on a race meeting to entertain officers who were on stand-by along the south coast of England, braced to meet a possible invasion from Napoleon. 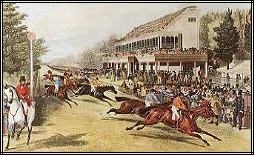 It was a huge success, and in 1801 the first public race meeting was established racing there permanently. Although it now has several meetings, the big one is held in July. The Goodwood Cup is one of the most famous Goodwood races, an important event for stayers founded in 1812 by the 3rd Duke of Richmond. Initially a three mile run for a 100 guineas trophy, the distance was later dropped to 2 miles 5 furlongs, and has been won by some of racing's great names, including Priam, Alice Hawthorn, Doncaster, and St. Simon. Originally a race confined to three-year-old fillies, the Nassau Stakes was opened up to older fillies and mares in 1975, to make the race more competitive. It was upgraded from Group 2 to Group 1 status in 2000. The Goodwood track is a twisting, undulating course on downs land, and does not suit the big, long striding horse. Run on the straight 6 furlongs course, the Stewards' Cup is invariably contested by a large field of tough sprint handicappers. One of the most interesting winners was the 1978 hero Ahonoora. He took the prize at odds of 50-1, and although a sprinter himself, he later went on to sire an Epsom Derby winner in Dr Devious. Between 1940 and 1945 the race was only contested in 1941, when it was run at Newmarket as the Stewards' Handicap. The first Sussex Stakes has now become a major race in the calendar for all top-class milers.